I watched the same spectacle when I was Weston’s age. Some of these fish may be the same ones I saw way back then. These pose a huge problem on the coast, where they get trapped in waterfowl impoundments during the winter, and then 6 months later, have a sudden die off as the water becomes too hot/anoxic/shallow. Wading birds feed on them, and too often, avian botulism breaks out. I suppose the same thing may happen in the Lake Erie Marshes. I've seen plenty of carp mucking around the low water without much hope of surviving. The Pymatuning Reservoir on the Ohio/Pennsylvania line consists of two lakes separated by a spillway. 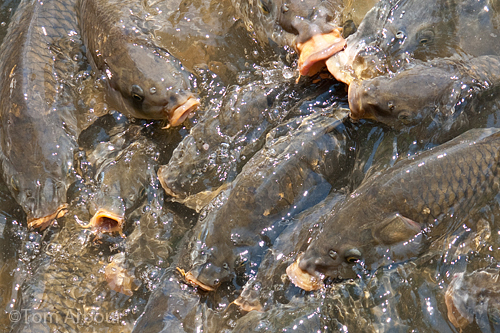 The carp in the upper lake congregate at the top of the spillway to gobble down bread handouts from tourists. I didn't know this occurred in other locations as well. Keep Weston away from the edge, Tom; he could get suckered to death if he fell in! Hey, that gives me an idea for a horror movie...vampires, shmam-pires. I just read an article last night in the magazine about the West, "High Country News," that showed a very similar image of carp waiting for tourists' handouts in Lake Mojave on the Arizona/Nevada border. They're everywhere, they're everywhere!